president | Habari Gani, America! (Reuters) – President Barack Obama plans to meet with several Republican senators for dinner on Wednesday as part of his effort to revive talks to tackle the nation’s long-term deficit, a congressional aide confirmed. via Obama to meet with Republican senators over budget | Reuters. President Barack Obama on Monday called on the nation’s governors to lobby their respective congressional delegations to prevent the looming sequestration cuts set to kick in Friday. At the annual gathering of the National Governors Association, Obama urged the bipartisan group of state executives to review the state-by-state reports issued by the White House Sunday outlining how the more than $1 trillion in across-the-board cuts would affect their constituents. Obama also addressed state and federal partnerships in infrastructure and education. 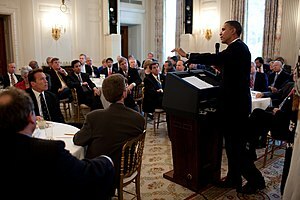 via Obama Asks Governors for Sequester Help : Roll Call News. Barack Obama is widely known as the United States’ first black president. But is he really the country’s first African-American commander-in-chief? via ‘Black Presidents’: 6 United States Commanders In Chief Before Obama. Does the Obama administration have to be held accountable for the reversal of the many systems, that have been strategically put in place over the course of hundreds of years, and are now negatively affecting minorities, women and other vulnerable groups? Of course! That having been said though, it is important to recognize that holding any administration accountable has to be done along with other actions that people take by themselves, for themselves. via Nomalanga: Why Black People Are Poor, Broke and Experiencing Lack | Healthy Black Woman. Warning of grave economic consequences if a package of automatic spending cuts takes effect in coming weeks as part of the sequester, President Barack Obama Tuesday urged Congress to pass a short-term package of spending cuts and to close tax loopholes. via OBAMA: ECONOMY WILL SUFFER FROM SEQUESTER | POLITICO.